Sometimes real foods simply don’t translate correctly when captured in pixels or on film. Fortunately, you can use non-food items in your food styling and photography to make your food and drink images more appetizing than the real thing. Pretty backgrounds, nice lighting, clean glasses, gorgeous liquids, and an accent or two all contribute to creating a great beverage shot. But what if the drinks need some ice? If you photograph a drink with real ice cubes, the ice cubes won’t look clear and transparent. As you can see in the following figure, the ice looks white and not so refreshing. 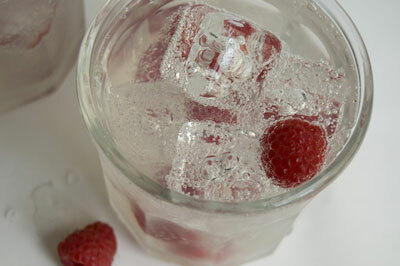 Real ice cubes can look white and boring. In order to avoid this problem, you can use artificial ice cubes made from hard plastic or acrylic, like the ones shown in the following figure. Yes, it sounds odd, but these cubes are used all the time in commercial drink photos! 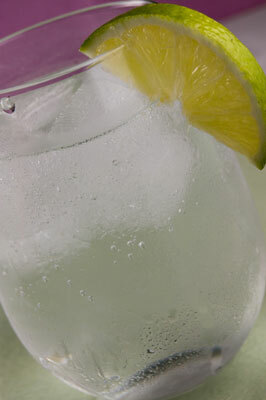 Artificial acrylic cubes make this drink appear more refreshing. Acrylic cubes used to be quite difficult to find and were always super expensive, but these days, some good, basic cubes are widely available. A 2-pound bag will run you just about $25. If you need to, you can buy the high-end cubes in different shapes: crushed ice, melting ice, chipped ice, and formed ice. These handmade bits of perfection are exquisitely realistic and run between $30 and $40 per cube. Because of the expense, you may want to rent these cubes from a good prop company. White glue for milk: Shooting real milk can be a bit of a problem. On camera, milk essentially looks like thin, gray water. Not the most appetizing! To get the right look for a dish with milk, food photographers often use common white glue to give the “milk” the look of, well, milk! Brown shoe polish for meat: Use a paper towel or small cloth to rub just a little brown shoe polish on a beef or poultry roast. Doing so really brings out the brown in the meat with a nice added subtle shine. Blowtorch for meat: Need more browning? Use a cook’s blowtorch for browning turkey or burger edges. This technique can enhance the look of any meat. Cardboard for sandwich or pancake separation: Little pieces of cardboard work great as an anti-smushing solution for foods with layers. As you can see in the following figure, a small piece of cardboard can lift and separate the layers of a sandwich, burger, or pancakes. Using this trick makes for a nice, tall stack of pancakes and a much beefier-looking burger. 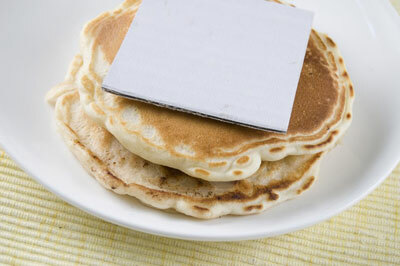 Use cardboard to separate the layers of pancakes or burgers. Cotton balls or wet paper towels: When you’re a little low on ingredients, wad up a few damp paper towels or cotton balls and place them at the bottom of your bowl or container. Evenly distribute your ingredients over the false bottom to give your dish a look of more, even when you have less. Steam chips are small bits of chemical goodness available from most high-end photo supply stores. They generally come in granular form, and you mix them with water to generate the steam. You can also try a small bit of dry ice to get a constant flow of steam going for your photo. If you use a compact steam iron on foods, the steam may hold long enough to get some good shots. Try aiming the steamer toward the back of the dish, so the heat doesn’t affect the look of the food at the front. When photographing steam, your background needs to be dark enough that the camera can properly distinguish the steam from the background. Steam is just too subtle to capture with a light background. Soap bubbles in drinks: Stir just a tiny bit of dish soap into coffee or another hot drink. The soap provides a little crop of bubbles near the edge of a cup. These bubbles increase the realism of the image and can help you achieve that successful hot-drink look.